One of the best ways to decide if you should buy a house is to look at the real estate market in your local area and try to determine if existing conditions work for your situation. Here are some national key indicators and trends to note, courtesy of the National Association of Realtors and Ellen Paris, Forbes.com contributor. The old rule of “supply and demand” applies to the housing market. When there are fewer houses for sale (low inventory), house prices typically increase, because there are more buyers than houses for sale. When the inventory number of homes for sale is high, home prices typically drop because there are more houses available than buyers. How does this help answer the question, “Should I buy a house in 2019?” Last year, was a competitive market for home buyers. There were more home buyers than houses for sale. Things improved throughout the year beginning in October and have continued to improve into 2019. The inventory forecast for 2019 is moderate, coming in between a 6-7 percent increase. This growth will be seen in the mid-to higher-end price tier, not the entry-level priced homes, making it tougher for first time home buyers. Now for some bad news. Housing prices have been rising steadily the last few years, and this trend will continue in 2019. The national median-existing home price is expected to rise 3.1 percent in 2019, according to the National Association of Realtors. Buy a home today for $200,000 and that same home may cost you $206,200 by the end of the year. $6,200 is a lot of money. Prices are expected to climb throughout the year, and into 2020. If purchasing a home is something you’re seriously considering, you will likely pay more by waiting. Yes, continue to do your research. But, we recommend you speak with our local real estate and mortgage specialists and get the best answers to your questions. They will also explain how you can save money when you buy a home with Homes for Heroes. The number of days the average home stays on the market can help determine if you’re in a hot or cool market. The longer a home stays on the market, the better it is for buyers. Sellers are more likely to reduce the price or accept an offer below their asking price when the home takes longer to sell. The average amount of time homes spend on the market has been dropping since 2010 and it’s expected to continue in 2019. That means home buyers will need their ducks in a row to act fast on the home they want. Here’s where things get tricky. All the key indicators we’ve discussed so far are following general year-over-year trends. But the housing market fluctuates greatly depending on what time of year it is. Spring is the busiest home-buying season, so that’s when inventory and prices peak, and average days on the market decreases. But things slow down in the fall and winter months. So, depending on your goals and timeline, the market could look differently if you wait to buy a home. The interest rate is a big topic of conversation this year, and probably one you’ve kept top of mind when asking, “Should I buy a house?” The Federal Reserve has raised interest rates a couple of times this year. In 2018, the average rate for a 30-year, fixed-rate mortgage was 4.54 percent, according to FreddieMac mortgage rate trend data since 1972. In January, the Federal Reserve backed off their stance on raising interest rates, at least in early 2019. This is good news for potential home buyers like you. If you’re wondering how interest rates affect a potential homebuyer, essentially interest rate increases mean banks raise mortgage loan rates, costing home buyers more money over the life of their mortgage. Experts say rates will probably continue to increase throughout 2019 and go as high as 5.50 percent. Some experts predict more modest increases. The fact is they are going up and home buyers will likely end up paying more in 2019. For most potential buyers, federal interest rates don’t matter nearly as much as their credit history. That’s because the mortgage loan interest rate you get from a bank is largely determined by your credit score. People with lower credit scores typically pay higher interest rates. The difference in rates can add hundreds of dollars to your monthly mortgage payment. The smart way to go is to improve your credit score. If you haven’t checked your credit lately, you may want to take a look at it. Every American is entitled to one free annual credit report from each of the three major credit bureaus. To get your report, go to www.AnnualCreditReport.com. But note, these reports will not contain your actual score. For that, you may need to pay a small fee. Many banks and credit card companies also offer credit score checks to their customers for free, so check to see if this service is available to you before paying for your score. Pay down your credit card bills to within 10 percent of your limit. If your card’s limit is $1,000, your balance should be no more than $100. Doing this will increase your score almost immediately. Most financial experts agree that your housing costs should total no more than 30 percent of your income. Ask yourself, “Can I find an affordable home based on what I’m earning now?” Also, look at your debt-to-income ratio. If you’ve got a high amount of debt and a relatively low income, it will be more difficult to get a home loan. Paying down your debt before applying for a mortgage can make things easier. Experts recommend putting down 20 percent or more when you buy a house, and there are a few reasons why. For starters, if you put less than 20 percent down, you’ll have to pay private mortgage insurance (PMI). On a $300,000 loan, that could cost you an extra $250 every month. Another reason to make a larger down payment is to protect yourself in the event that you have to move shortly after you buy the home. With a small or nonexistent down payment, you might find yourself underwater, owing more than you can sell the home for, if housing prices fluctuate. This is particularly important for heroes who work in professions where being transferred is a real possibility. In addition to a down payment, you’ll also need money for closing costs. Experts say you can expect to pay around 2 to 5 percent of the value of the property. So, on a $300,000 house, you’ll pay between $6,000 – $15,000 in closing costs. Working with Homes for Heroes specialists can often help save on some of your closing costs. Your down payment and closing costs make up two of the four other costs of buying a house you will need to consider. This is a lot to take in. 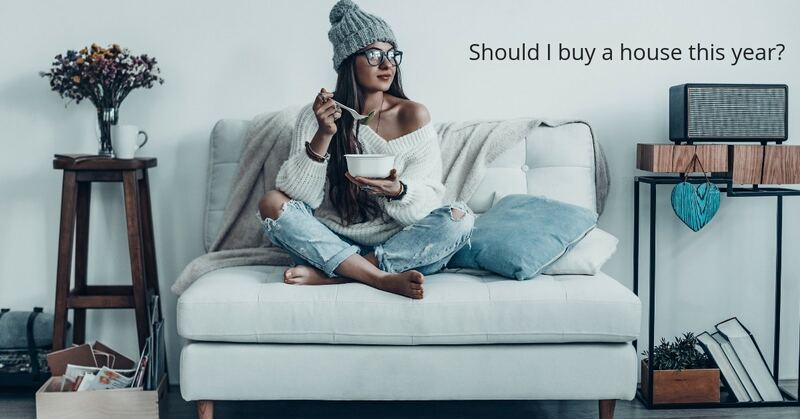 Hopefully we provided some good information to help answer your question, “Should I buy a house in 2019?” Remember, not every market is the same. Just because certain trends are happening nationally doesn’t mean those same conditions are affecting the community where you want to buy a house. So if you’re ready to buy, or simply want questions answered, register with Homes for Heroes. We’ll connect you with our real estate and mortgage specialist in your area who can give you accurate information about the community where you want to buy a house, and how your financial situation stacks up to make it happen. Heroes who use our real estate and mortgage specialists save an average of $2,400 when they buy a home. So, whether it’s in 2019 or somewhere down the line, Homes for Heroes wants to help you buy a house and save money in the process. Before purchasing a townhouse, it is important that you know the quality of materials used in building its walls, especially those that are shared with neighboring townhouses. Thanks for sharing a great article. Good point, Sam. Thank you! As with most financial endeavors, timing can be everything, and that goes double for landing a dream home. Pricing, interest rate levels, the calendar month of the year, and your own personal cash situation all can factor in on when to buy. I’m not moving until my son is also ready to sell his house so I know where to move in close proximity to him. I love the idea when you say that it’s more cheaper when house is listed on the market longer and the old rule for supply and demand. Thank you for having this blog. Condos usually have association boards and committees that are comprised of residents to manage the community. In comparison to an apartment community, condo owners have a much stronger voice within their community and how regulations and bylaws govern the community while apartment renters are mainly at the whims of their landlords. Thanks for sharing a great post. Thank you for pointing out that we need to understand our financial situations first before deciding to buy a house. My partner and I have been planning to invest in buying our own home this year, and I think it’s necessary for us to assess our current credit score. This is to avoid further financial trouble in the future. In the event that we decide to buy one this year, we will consider hiring competent real estate agents, and services that can help us make the most of our money. Thanks for the tip. If you have your search narrowed down to a few neighborhoods, don’t be afraid to do a deep dive into each of them. If you move there, you’re not only committing to buying property, but you’re effectively becoming a part of the neighborhood’s patchwork. Thanks for sharing great article. I like how you mentioned that the longer a home is on the market, the lower the price tends to get. Oh of my friends has been saving up a long time for a house, so he’ll be buying one soon. These tips could really help him out. Thanks for the great advice on buying real estate! One of my friends recently got engaged, so he may be buying a home soon. I like how you mentioned that the longer a home is on the market, the more the price tends to drop. These tips could really help my friend buy a single family home, so thanks for sharing them. Hi Taylor, thank you for letting us know your friend may find this post helpful. That’s why we’re here: 1) Support our heroes 2) Give back to heroes. Have your friend let us know if there are other ways we can assist. Oh definitely. Many of my family members are veterans.